This article is about the Bug River, a tributary of the Narew River. For the Southern Bug River, located in Ukraine, see Southern Bug. The Bug River (Polish: Bug [buk] or Western Bug; Ukrainian: Західний Буг, Zakhidnyy Buh, Belarusian: Захо́дні Буг, Zakhodni Buh; Russian: Западный Буг, Zapadnyy Bug) is a major European river which flows through three countries with a total length of 830 kilometres (520 mi). The name Bug probably came from the old Germanic word baug-s which meant something winding, genual, bent (what was mentioned about river by Gervase of Tilbury who used latin term armilla). Slavs adopted the word Baug from the Goths who previously lived in large numbers near the river. Bug River is a left tributary of the Narew river. It flows from the Lviv Oblast in the west of Ukraine northwards into the Volyn Oblast, before passing along the Ukraine-Polish and Polish-Belarusian border and into Poland, where it follows part of the border between the Masovian and Podlaskie Voivodeships. It joins the Narew river at Serock, a few kilometers upstream of the artificial Zegrze Lake. This part of the Narew between the confluence and the Vistula River is sometimes referred to as Bugo-Narew but on December 27, 1962 the Prime Minister of Poland's act abolished the name "Bugo-Narew", soon after Zegrze Lake was completed. It is connected with the Dnieper River via the Mukhavets River, a right-bank tributary, by the Dnieper-Bug Canal. 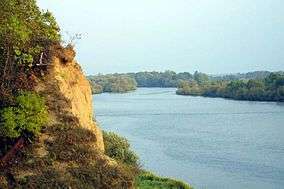 On the Bug River, a few kilometers from the Vysokaye in Kamenets District of the Brest Region, is the westernmost point of Belarus. 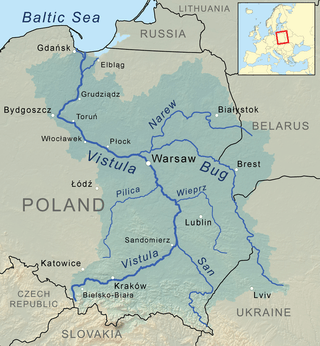 The total basin area of Bug River is 39,400 square kilometres (15,200 sq mi) of which half, 19,300 square kilometres (7,500 sq mi) or, 50%, is in Poland. Little over a quarter,11,400 square kilometres (4,400 sq mi) or 26%, is in Belarus, and barely a quarter, 8,700 square kilometres (3,400 sq mi) or 24% lies in Ukraine. The climate of the Bug basin is temperate. The basin experiences annual high-water levels during spring flooding due to thawing snow, after which a low flow period starts and lasts until October or mid-November. Occasional summer floods often occur in the headlands, where mountains influence favorable flash-flood conditions. In Autumn the water level increases are inconsiderable; in some years they do not happen at all. During the winter the river can have temporary ice-outs that sometimes provoke ice jams, causing an increase of the level up to 2 metres (6.6 ft). The resultant water levels are changeable due to the instability of ice cover. Significant floods during the last 60 years in Belarus were registered in 1958, 1962, 1967, 1971 and 1974. The largest spring flood was observed in 1979, when the maximum water discharge was 19.1 cubic metres per second on 24 March 1979, at the village of Chersk; 166 cubic metres per second near the village of Tyukhinichi (Lesnaya river) on 31 March 1979; and 269 cubic metres per second near Brest on 1 April 1979. A similar spring flood occurred in 1999, when the spring run-off in March–May exceeded the average annual value by almost half again (48%). The last time the Bug flooded in Poland and Ukraine was in 2010 and the last time it flooded in Belarus was in 1999. Wikimedia Commons has media related to Bug. ↑ "Bug River". Encyclopædia Britannica. Encyclopædia Britannica Online. Encyclopædia Britannica, 2011. Retrieved 10 April 2011. 1 2 3 4 5 6 7 8 D.François; J. Kikken; P. Moiret; J. Paulzen; B. Stevens (2010). "Characteristics and cross-border cooperation within the river basins of the FLOOD-WISE project" (PDF). Zuyd University of Applied Sciences Maastricht, the Netherlands. pp. 49–55. Retrieved 29 October 2013. ↑ "Main Geographic Characteristics of the Republic of Belarus". Land of Ancestors. The Scientific and Production State Republican Unitary Enterprise “National Cadastre Agency” of the State Property Committee of the Republic of Belarus. 2011. Retrieved 20 September 2013.